Superman's Pal Jimmy Olsen 85, June 1965! Download Episode 383 Part I! SUPERMAN'S PAL JIMMY OLSEN 85, June 1965, was published on April 8, 1965. It contained 32 pages for the cover price of 12¢. 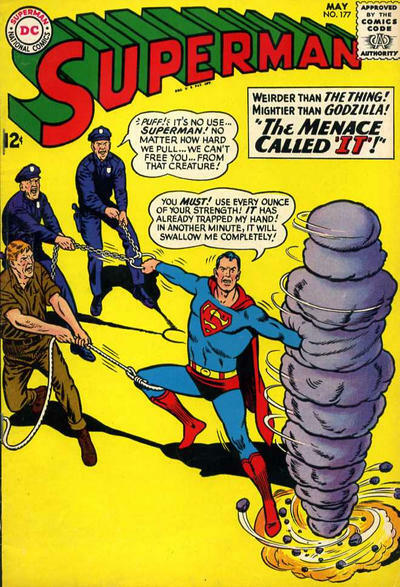 Mort Weisinger was the editor, and the cover was pencilled by Curt Swan, inked by George Klein and inked by Sheldon Moldoff, featuring the issue's third and final story. - (3:51) LOVE ME, LOVE MY BEAST, written by Bill Finger, pencilled by Curt Swan, inked by George Klein and lettered by Milt Snappin. This story was reprinted in SUPERMAN FAMILY 172, August/September 1975, published on May 13, 1975. It contained 64 pages for the cover price of 50¢. - (22:49) THE ADVENTURES OF CHAMELEON-HEAD OLSEN, written by Jerry Siegel, pencilled by John Forte and inked by George Klein. This was Siegel's 88th Superman Family story we've covered on the podcast, and his 142nd overall for the era. JIMMY OLSEN'S PEN PALS letter column. 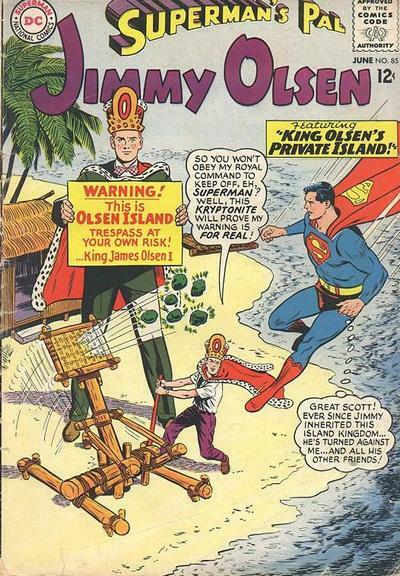 - (36:44) KING OLSEN'S PRIVATE ISLAND, written by Edmond Hamilton, pencilled by Curt Swan and inked by Sheldon Moldoff. Next Episodes: SUPERMAN COMIC BOOKS COVER DATED JUNE 1965: PART II: 80 PAGE GIANT 11 (starring Superman), PART III: ACTION COMICS 325 & PART IV: WORLD'S FINEST COMICS 150! Action Comics 324, May 1965! Download Episode 382 Part III! ACTION COMICS 324, May 1965, was published on March 25, 1965. It contained 32 pages for the cover price of 12¢. Mort Weisinger was the editor, and the cover was pencilled by Curt Swan and inked by George Klein. 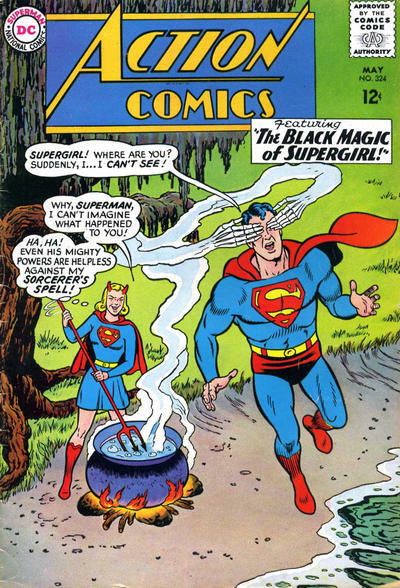 It featured the Supergirl story, which was the second and final story in this issue. - (8:12) THE SECRET LIFE OF CLARK KENT (12 pgs. ), written by Leo Dorfman and drawn by Al Plastino. - (31:45) METROPOLIS MAILBAG letter column. - (39:47) THE BLACK MAGIC OF SUPERGIRL (13 pgs. ), written by Leo Dorfman and drawn by Jim Mooney. This story was also reprinted in ADVENTURE COMICS 416, March 1972, published on January 4, 1972. It contained 100 pages for the cover price of 50¢. It was also reprinted in THE BEST OF DC 38, July 1983, published on April 7, 1983. This story was finally reprinted in SUPERGIRL: THE SILVER AGE OMNIBUS. Also highlighted in this issue are the ads and other features. 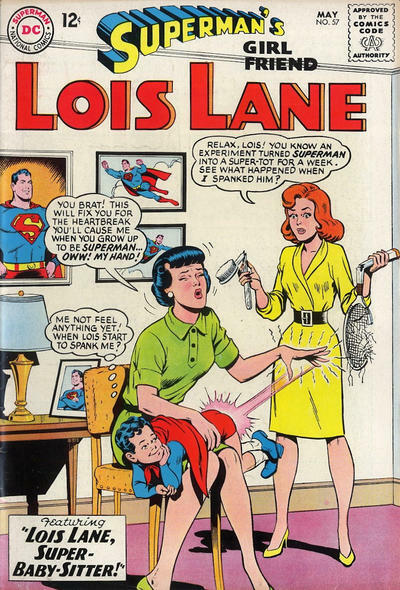 Next Episode: SUPERMAN FAMILY COMIC BOOK COVER DATED MAY 1965: PART IV: SUPERMAN'S GIRL FRIEND LOIS LANE 57 & ELSEWHERE IN DC COMICS for the other DC titles which carried the May or May/June 1965 cover date! Then we will feature: SUPERMAN FAMILY COMIC BOOKS COVER DATED JUNE 1965: PART I: SUPERMAN'S PAL JIMMY OLSEN 85, PART II: 80 PAGE GIANT 11 (starring Superman), PART III: ACTION COMICS 325 & PART IV: WORLD'S FINEST COMICS 150!